Radio Today has compiled the Top 30 Most Powerful Talent on Australian Radio, once again topped by breakfast co-hosts for KIIS 106.5, Kyle Sandilands and Jackie Henderson. “I’m humbled to be included on a list that includes such great radio talent. I love my job and even though it comes with a certain amount of responsibility, the most important thing for me is that our audience enjoys the show and get a laugh out of what we do,” Henderson told RT. The Top 30 includes the most influential, highest paid, top rating and best-known talent in Australian radio. In fact, a major factor in determining the list was, recall and profile – how well each personality is known in their own markets and also outside of their hometown. These are the men and women who wake you up and eat cornflakes with their respective cities or entertain them on the drive home after a busy day at work. The market size and reach of stations and networks have been taken into account. We consulted many industry insiders and heavyweights, past and present in compiling this list. The names listed are part of the soundtrack to our lives each day, they all have a role in shaping our hearts, minds and views. Through their daily on-air banter they reflect the society we live in and the people in it. This year there are 32 men and 16 women listed individually – so there is still a fair way to go on gender equality in Australian radio. Here are the 30 most powerful of them all. The most successful breakfast duo in Australian FM radio history. They top the Sydney FM breakfast ratings at ARN’s KIIS. They are responsible for turning around KIIS Sydney. One of Australia’s highest rating and highest profile breakfast announcers, Alan is one of the most influential personalities in Australian radio. Has been at the helm for 15 years. Top rating Breakfast announcers of Macquarie Radio’s 3AW. They have lead Melbourne’s breakfast ratings since 2001 now with over 20% ratings share. Eddie has hosted the Hot Breakfast for eight years alongside Luke Darcy and recent addition comedian Wil Anderson who replaced Mick Molloy. Nova’s top rating show lead by Marty Sheargold with Tim Blackwell and Kate Ritchie. The top rating show has now been with this line-up for almost four years. Currently the highest rating drive show nationally. The national drive duo on the Hit network. Blake and Lee teamed up back in 2003 and have announced their retirement from radio at the end of this year. Top rating morning announcer currently with the highest rating morning show in Sydney. Was inducted into the ACRA Hall of Fame this year. WSFM Breakfast hosts Amanda Keller and Brendan Jones. Have been around the top of the ratings in breakfast in Sydney for over a decade now. Amanda Keller was recently inducted into the radio Hall of Fame. Top rating breakfast host for SCA in Melbourne. FiFi is a former member of The Shebang and previously was on national drive with Jules Lund on the Hit network. Nova Sydney’s breakfast duo Ryan ‘Fitzy’ Fitgerald and Michael ‘Wippa’ Wipfli have now been spearheading Nova’s success for seven years now. Originally from Nova100 Breakfast, they have been highly successful in recent years at ARN’s KIIS network. Dave and Kate join SCA for national drive on the Hit network next year. Has been co-host of the top rating Hot Breakfast with Eddie McGuire on Triple M Melbourne. Recently commenced as host of Triple M drive with Jane Kennedy. 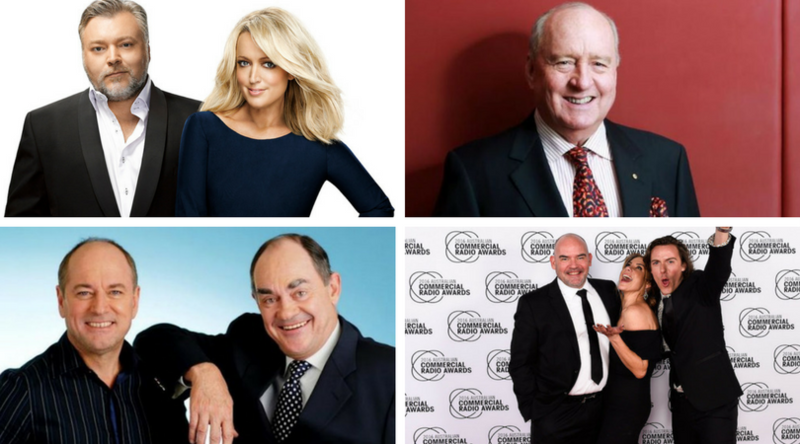 Leads Melbourne morning ratings and an inductee into the Australian Commercial Radio Hall of Fame. Nova 100’s high rating breakfast show commenced just under 2 years ago now. Hosted by former Big Brother contestant Chrissie Swan, comedian Sam Pang and AFL footballer Jonathan Brown. Host of Radio National’s breakfast show, Fran is a leading journalist and political correspondent. He appears weekly as special guest on Melbourne’s Nova100 breakfast and Tony always makes a big impact with listeners whenever he appears. Nova Brisbane’s number one breakfast show with Ashley ‘Ash’ Bradman, Kip Wrightman, David ‘Luttsy’ Lutteral, as well as Susie O’Neill. The trio begun back in 2005, and after a short hiatus, the current format debuted in 2016. GOLD Breakfast is Jo Stanley, Anthony ‘Lehmo’ Lehman and Troy Ellis. Lehmo will not be returning to Gold next year, according to recent press reports. Nova Perth’s top-rating (and very successful team) have been together since 2009, making them the longest serving breakfast show in Perth. Co-host of Triple M Brisbane’s Marto Ed & Robin breakfast show. The top-rating show will see Ed Kavalee replaced by comedian Lawrence Mooney in 2018. Since March 2011, the ex-NRL player and commentator has been a co-host on Triple M’s Sydney breakfast shift The Grill Team, along with Mark Geyer, Emma Freedman and Gus Worland. One half of Melbourne’s breakfast team alongside Meshel Laurie. Matt is in his last year as breakfast host at KIIS, so the question everyone is asking is where will the highly experienced and successful announcer show up next? Liam Stapleton and Ben Harvey are former Adelaide community radio hosts, and now host breakfast on triple j to over a million listeners nationally. One-quarter (now one-third) of Hit105 Brisbane’s breakfast show, working alongside Stav, Matt and formally Osher. Originally from South Australia, Abby has been part of the Hit105 Brisbane show since 2011. Top-rating host, Ben is seen as the future of talk radio in Sydney and the “heir to the throne” of the talkback giants. Co-host of the KIIS breakfast show in Melbourne, Meshel has also worked at Nova and has worked with top names including Marty Sheargold, Wil Anderson and Tommy Little. Has just joined Mick Molloy for Triple M drive, which will be broadcast nationally in 2018. Janes was originally part of the hugely successful D Generation radio show. Has just joined Eddie and Luke for Triple M Melbourne breakfast. This marks a return to radio for Wil, after having appeared in shows on triple j and Triple M with Lehmo and Adam Spencer. From The Project and now co-host of Hit Network’s ‘early drive’ show nationally with Tommy Little. Has been host of the top-rating morning program on ABC Sydney for the past two years. Was previously the star of the number one rated breakfast show ‘The Morning Crew’ on 2day FM for over a decade. Melbourne comedian who now hosts 2day FM breakfast with Harley Breen (who will be replaced by Ed Kavalee in 2018). Has had a challenging first year, but we can expect more from her next year. Good one but Im not sure Em Rusciano with a 3 share should be on this list. Hamish and Andy should be ahead of Kate Tim Marty as they have been around longer and are on a lot more stations. KTM should be Number 1. The best show on Aussie radio. How could ARN let #11 slip through their fingers. SCA have 12 of the big names Nova have 6 and ARN 5. Didn’t count the old talk and ABC types. Good showing from SCA maybe they will get some ratings next year. You’re a bit light on women. What about Ash London, Jodie in Adelaide, Heidi from 92.9, Emma Freedman and Ellie Mobbs-Angel. Great chicks doing great work on air. Odd that you name the cohosts for every person on this list except Fifi Box’s comrades Brendan Fevola and Byron Cooke (and recently departed Dave Thornton, since you also mention prior cohosts for many of the others). Fifi hasn’t been a member of The Shebang for almost ten years, so that was a strange choice for including in her bio over the names of her current cohosts. This list must be the kiss of death. Matt and Meshel are gone and Jo and Lehmo too. And Harley. Who is next ? Thats five gone out of 30. Im taking bets 1 or 2 more names on here will get the chop by the end of the year. Its not over yet. And seriously, when do we stop referring to Chrissie Swan as ‘former Big Brother contestant’? Hasn’t she at least earned the accolade of ‘media personality’ by now!? Otherwise, why aren’t we referring to Nathan and Fitzy as ‘former Big Brother contestants’, or Kate as ‘former TV soapie actress’, maybe highlight that Em is a ‘former Australian Idol contestant’ too and that Eddie is a ‘sports journo and game show host’. It all sounds pretty irrelevant to me. Radio Today I always really enjoy these countdowns. But there is never any mention of anyone in regional radio. Can you look at doing a Top 20 regional talent at some stage. You would win a lot of friends over. These are the names that need some encouragement and support. The big city names already have plenty of support. Amos Gill worthy of a mention. Hamish and Andy should be number 1. Best show ever on radio. @Annoyed Listener- FiFi is the star of that show- you could take or leave Fev or Byron, and it wouldn’t make a difference. The other shows- if someone left it could make or break the show. I know Red Symons is leaving but I would have him ahead of the Nova Brekky Crew in Melbourne except Browny, the Kiss Brekky Crew in Melbourne IMO and I agree with comments eventhough she is an excellent talent that it’s too early to have Jane Kennedy in the Top 30 as she is on a new show despite many years of experience. I am sure though the show with Molly will succeed. Ross Stevenson and John Burns should be number one. Why is it, that Channel 10 is mostly made up of radio hosts.